The Mayweather is the exception to large sofas with hulking masses. 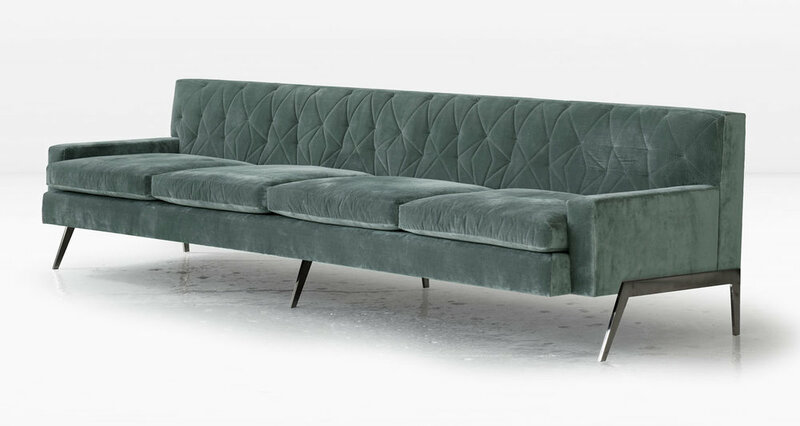 An abstracted, tufted pattern has been created on the back cushions. The loose seat cushions on the 2.0 are surrounded by down for ultimate comfort. The 1/2" thick metal legs have burnished faces and polished edges. Shown with Silicon Bronze legs and Leaf Green Silk Velvet fabric. Last three images shown with Nickel legs and Ice Blue Silk Velvet fabric.